Gathered for the first time, here are Sophie Tucker's earliest recordings, from Edison wax cylinders and impossibly rare discs, chronicling the rough and ready rise of this lasting icon of the double entendre. A master of self-marketing, Tucker learned long before she became known as The Last of the Red Hot Mamas that the key to her success lie in controlling--and changing as needed--the facts of her personal story. Documentarians Susan and Lloyd Ecker unravel all the loose ends and contradictory threads comprising the early years of one of the 20th century's most colorful stage personalities. With a hardback book-binding and 72 full-color pages, this beautiful package features dozens of illustrations from Sophie's personal scrapbooks, a foreword by Michael Feinstein, and a personal remembrance by Carol Channing. 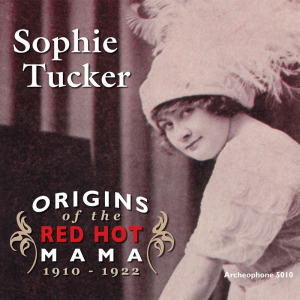 Visit Origins of the Red Hot Mama's expanded catalogue page to see the complete track listing, read an extended description, and listen to sound samples.